Modern, integrated pipe sealing systems guaranteeing no leaks of precious water resources are essential and allow for the most efficient use of energy. 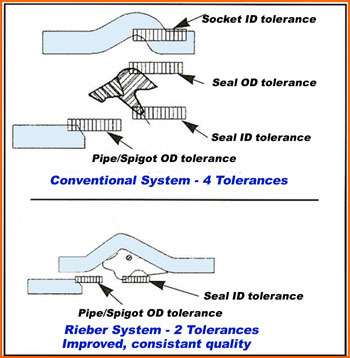 The Rieber seal, fixed in the pipe socket, has already established a reputation as the most reliable jointing system for PVC pipes, both pressure and non-pressure. 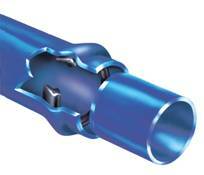 Improved quality of pipe-end sockets. Simplified production – the socket is formed automatically over the seal, making the seal an integral (locked-in) part of the joint. Partnership with the most successful and advanced seal company in the world. Pre-compression of seal in the ring groove prevents contamination of sealing surfaces, especially in sandy areas. Fool-proof sealing system, user friendly, suitable for unskilled installers. More forgiving with respect to pipe ovality and pipes cut in the field (chamfer). On time commissioning of pipe lines. Superior pipe joint and ease of installation means on-time testing and commissioning of pipe lines. Eliminates leaks – no water loss. More efficient use of energy. Ultimate reliability of sealing performance long-term. Self-sealing regardless of pressure, better vacuum performance. Means high resistance to infiltration or exfiltration. Provides pipelines of greater value. Confidence in having the best, most reliable sealing system in the world.